Ok, you got me on this one.Little time to read — still working two jobs. Recently re-re-re-watched M*A*S*H the 11-year TV series, so I’m ready for more Alan Alda. Do you listen to books on your commute, David? This would be a good one for that — its nit heavy with details or character development or anything! 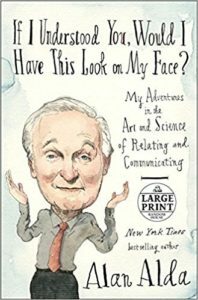 So does Alda write about non-face to face communication? How much communication, even sensitive, emotional type, is done through texting and email? What are his comments on that? What happened to you and your ankle? He does address writing a bit, late in the book — applying the same principles he uses for face to face. Sprained my ankle hiking. Klutz. That does sound like a fun book to read as well as helpful. Maybe it will help me with my “Being Present” word.